Have you been wondering if your dental or orthodontic practice could benefit from a new website? This checklist will help you discover if your current site could use an overhaul to attract more patients. If you don’t like looking at your current site, then maybe that’s a sign that your potential patients don’t either. If the layout or design is outdated, it may be time to invest in a new one. The main reason we recommend overhauling your website is if your rankings on Google have dropped significantly. Black-hat SEO companies are always involved in shady practices to get their clients listed at the top of Google. But Google eventually catches on and will penalize those sites, and in most cases, the penalizations can’t be reversed. And that only means one thing – you’ll need a new site to gain back those rankings. If this is the case, you really need to invest in a new website. 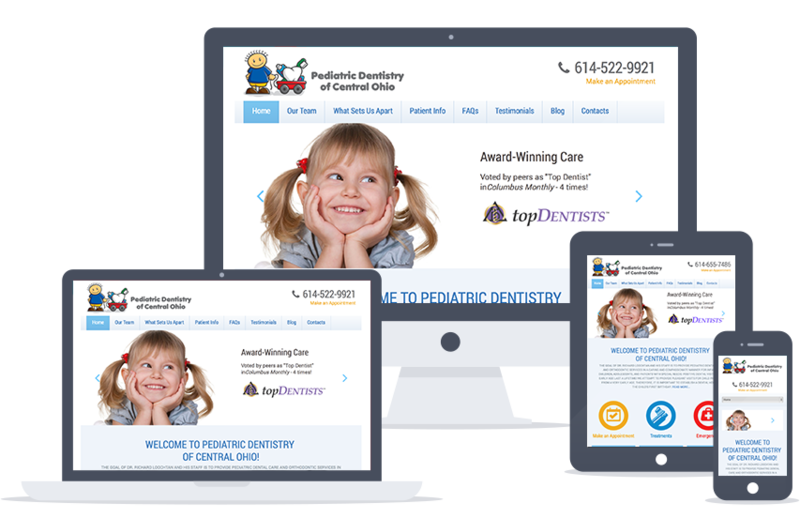 Today, close to 40% of dental site visitors are coming from mobile devices. Tablets and smartphones are everywhere, so if these users can’t easily use your site, it’s time for a new one. But when it comes to mobile sites, there are two options – building a mobile version of your site, or building a site in responsive form. We only recommend the latter and here’s why. A mobile site only works well if visitors are on smartphones. It won’t increase your rankings, and in some cases can actually hurt your Google rankings. It’s basically just a condensed version of your main site, so visitors might not see all of the information they are looking for. And you want to put your practice’s best foot forward. However, a responsive site is just that – it responds to whatever type of device your patients are searching from. The layout adjusts to fit the screen they are browsing on, and has all the information they’ll need. Multiple design formats and a dynamic HTML5 code are used to build responsive sites. Visitors will be able to see your entire website, not matter what device they are using. That means your site will be beautiful, searchable and readable no matter how small the screen is. And, responsive sites do really well on Google searches. Does it take several seconds for your website to load? If so, you could be losing out on valuable potential patients. An optimized site can load faster, but sites that are laden with images or that have a lot of code on the back-end will be hard to optimize. If yours is one of those, we would recommend just redesigning your slow site to one that will load quickly. Good Google rankings typically translate to a lot of patient traffic. But if your site has a low conversion rate, your phone won’t be ringing. Your minimum acceptable conversion rate should be five percent. If your site falls into one or more of these categories, we’d recommend you consider a redesign soon. We have a great design and development team that can help. Contact us and one of our representatives will provide you with a free quote. I have a quick question: Is there a way to check to see if your site has been penalized by Google? I have a website and don’t know how to promote can u guide me how I can get high ranking in google? Hi Aamir. The short answer is SEO (Search Engine Optimization). By having unique and updated content, building popularity for your site and optimizing it.